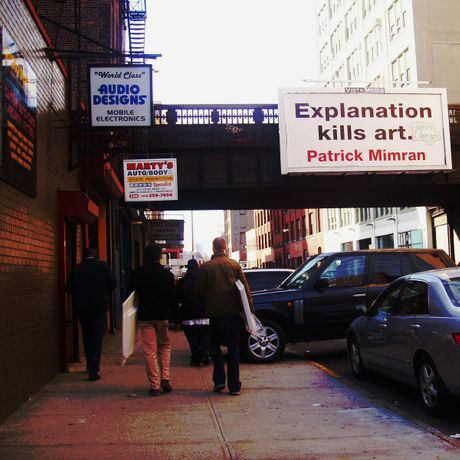 Patrick Mimran  Billboard Project, New York. Photo Sophia Kosmaoglou. By the end of the course you will have a good grasp of the historical underpinnings and current debates in contemporary art . You will be able to develop, articulate and contextualise your practice. You will develop your writing and research skills and formulate research questions to guide your practice and research. You will be able to critically evaluate your own work, as well as that of others. You’ll be able to critically discuss and evaluate contemporary art. The course will suit those wishing to develop their practice and research, prepare a portfolio, apply for a postgraduate degree in art or pursue a career in the arts. The course is open to everyone regardless of experience but it is particularly suited to those who have a background and experience in art and wish to develop their practice and extend their knowledge of contemporary art practices and discourses. The course will benefit painters, sculptors, print-makers, installation, performance, video and media artists, designers, sound artists, musicians, curators, writers and researchers. The course runs from 8 October to 3 December 2018, on Monday evenings 6:30-9pm for 9 weeks, with off-site visits on Saturday, 27 October 2018, 2:30pm-5pm. For more information please visit the website.